CUSTOMIZE NOW: Personalization Lab memorial pet stones for your best friend and companion. How to Order: 1 - Choose the size you want for the pet stone. 2 - Click "Customize Now" at the right. 3 - Please put the required information to create a unique Memorial Pet Stone. 4 - Please double-check your spelling and dates and place your order. 5 - AFTER CHECKOUT, please send a message in Amazon Messages with desired picture.| Customization is TOTALLY free - Prices vary based on size. A THOUGHTFUL PET LOSS SYMPATHY GIFT- Help a grieving friend or loved one remember their special pet with this beautiful pet memorial stone. The stone is engraved with a meaningful words and Personalization Lab let you customize the memorial for that special companion who is no longer here. PERFECT FOR BOTH INDOORS AND OUTDOORS - Available sizes are 6"x6", 11"x8.5", 12"x12". Deep engraved to last a LIFETIME. This stone will look just as good in your garden as it would on your fireplace mantle, shelf, or table. GET IT WITH CONFIDENCE: We ship orders within 1-2 Business Day. Being so sure about the great quality and unique design of these unique pet memorial stones, we offer you a 30-Day Money Back Satisfaction guarantee and best replacement policy in the improbable case that this pet memorial doesn't meet your expectations. All of our pet memorial grave markers are made with tender love and great pride in CA, USA. CUSTOMIZE NOW: Personalization Lab memorial pet stones for your best friend and companion. How to Order: 1 - Choose the size you want for the pet stone. 2 - Click "Customize Now" at the right. 3 - Please put the required information to create a unique Memorial Pet Stone. 4 - Please double-check your spelling and dates and place your order. | Customization is TOTALLY free - Prices vary based on size. 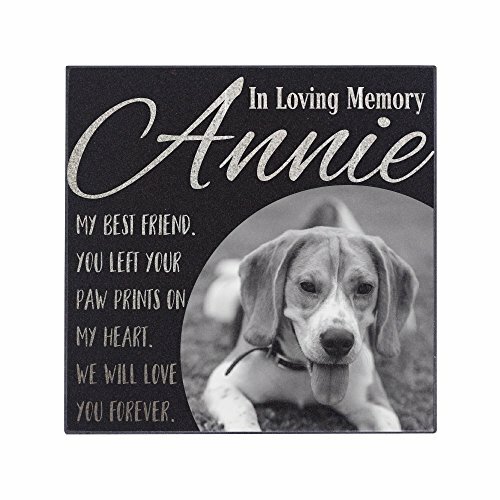 A THOUGHTFUL PET LOSS SYMPATHY GIFT- Help a grieving friend or loved one remember their special pet with this beautiful pet memorial stone. The stone is engraved with a meaningful words and Personalization Lab let you customize the memorial for that special companion who is no longer here. PERFECT FOR BOTH INDOORS AND OUTDOORS - Available sizes are 6"x6", 11"x8.5", 12"x12". Deep engraved to last a LIFETIME. This stone will look just as good in your garden as it would on your fireplace mantle, shelf, or table. GET IT WITH CONFIDENCE: We ship orders within 1-2 Business Day. Being so sure about the great quality and unique design of these unique pet memorial stones, we offer you a 30-Day Money Back Satisfaction guarantee and best replacement policy in the improbable case that this pet memorial doesn't meet your expectations. All of our pet memorial grave markers are made with tender love and great pride in CA, USA.